Senior Medical Officer of Grenada’s Ministry of Health, Dr Francis Martin (left) and St. Lucian parliamentarian, Moses Jn, Baptiste. Caribbean health and education experts have lamented the impact of free trade on the consumption of certain foods and beverages that are badly affecting the health of the region’s children. Senior Medical Officer of Grenada’s Ministry of Health, Dr Francis Martin said the reality is that many Caribbean schools are cash-strapped and so they turn to sponsors to support sporting competitions. Those sponsors, he said, then provide unhealthy sugar-based drinks to players. “It’s an issue of finance because countries, because of all these trade deals that are being signed, these countries cannot say, they cannot ban certain things and the truth is those persons already know the dangerous health benefits to these foods but precedent is set all around,” he told a panel discussion on Governance and Public Policy for Food and Nutrition Security Sustainable School Feeding Programmes. The discussion was one of several such for a that is part of the Caribbean Week of Agriculture being held in the Cayman Islands from October 24 to 29, 2016. CWA, which is sponsored by the Alliance For Sustainable Development, among other things, aims to promote the sustainable production and consumption of healthy foods by the Caribbean for the Caribbean. These include roots and tubers and fruits and vegetables that experts say help to reduce the development of non-communicable diseases like diabetes, hypertension and heart ailments that in turn take a heavy toll on countries’ national budgets. Martin noted that people are more likely to demonstrate if there is a shortage of pharmaceutical supplies are unfulfilled but fail to do so against the large quantities of imported fast foods. “We don’t so we ourselves are the hypocrites. We got to stand up and say ‘no’,” he said. While acknowledging that imported foods would be cheaper, Dr. Martin said the overall benefits to eat local would be healthier and less costly to individuals and the country. “I am empirically thinking though that even if local consumption, local procurement of foods are a little bit more expensive, in the long-run it’s going to be a bit more beneficial society when it comes to medical bills and paying for medications. The truth is, however, we need to make the business case for it and we are faltering in that regard,” he said. The Grenadian Medical Officer called for the training of health economists to make the case for healthy living. 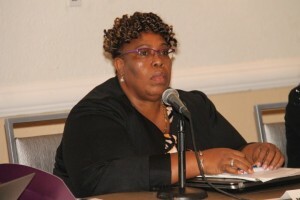 Director of Project Management at Jamaica’s Ministry of Education, Marcia Phillips-Dawkins told the seminar that her country was currently developing a policy to address healthy school feeding and consumption. “We know that sponsors will always come with their products but we have a responsibility to protect the health of the children and so the only way we can really do it is by saying what are the standards by which school facilities are to operate,” she said. She said concessionaires that operate eateries at schools have to abide by strict dietary rules to ensure students eat and drink health. Phillips-Dawkins said at least three Parent Teachers Associations in her countries have met with vendors, who sell at school gates, telling them what some of the items they can sell are. The Ministry of Education and the Ministry of Health in her country, she said, are establishing a Healthy Lifestyle Clubs to help sensitize students and inculcate responsibility about their own health. She added that schools are being provided with menus. Phillips-Dawkins conceded that it is more expensive to provide healthy school meals, but she could not immediately provide statistics on the impact of the pilot project that recently started. 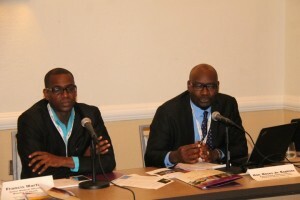 St. Lucian parliamentarian, Moses Jn, Baptiste said Caribbean politicians have failed to find solutions to deal with healthy living in contrast to the liberalization and improvement of telecommunications. “When it comes to food and sugar, our politicians have not yet garnered the strength and the conviction to do it and so I believe in some countries to cut subsidies on rice, flour and sugar is tantamount to suicide,” he said. The former government minister urged politicians to be “courageous and do what is right. However, the Grenadian Medical Officer believed that Caribbean politicians place greater priority on votes than on people’s welfare even if the experts provide the information. “The vote is extremely important for Caribbean politicians, the vote is extremely important. There are some things that I know must happen in our countries now… A lot of the times they do get the information but there are other things that get into the picture,” he said.